Estimates based on research indicate that from ten to thirty percent of the American population suffers from chronic or recurrent physical pain. Pain sufferers often feel that their doctors are not able to give them the treatment they need to alleviate their pain. They may have been told that it is all in their head, and they feel very alone when nobody can seem to give them support for being in pain. They feel helpless, anxiety-ridden, depressed, angry, frustrated, and out of control. They often turn to prescription pain medication, drugs or alcohol for relief – only to find that these quick fixes can cause more complications and devastation in their lives than the original pain. Pain is actually essential to our survival. Acute pain is temporary and it can be severe. It tells us that injury has occurred and that we must take action to protect ourselves from further injury and seek comfort so the body can heal. If these actions occur, healing usually takes place. However, sometimes people do not recover and the pain continues. Chronic pain is that which lasts longer than three months, is often ill-defined regarding its cause, and has a heavy impact on all aspects of a person’s life. Although the cause of chronic pain is usually difficult to pinpoint, most pain experts believe that it is caused by damaged and inflamed nerves, muscles and blood vessels – and it is very real. The body becomes locked into a vicious cycle. You naturally limit movement in the painful area, and this causes you to lose strength and flexibility. If you try to ignore the pain and increase your activity, the pain becomes so severe that you again become inactive. Sometimes you unconsciously guard against the pain and this leads to muscle tension and spasms. Your body becomes weak and deconditioned, and you begin to feel frustrated, angry, and depressed. Your friends and family do not understand the pain and may underestimate its impact on your life. This leads to more anger and depression. Sometimes, though, they may overindulge you, and this can make you feel more dependent and out of control of your own life. These negative emotions can actually perpetuate pain. The more negativity we feel, the greater our pain – and the greater our pain, the more negative emotions we experience. This negative spiral, though, can be broken. We are sometimes told that we will just have to live with our pain after all else has failed, but we are far from doomed at this point. The realization that nothing else medically can be done can actually force us to examine the way we have lived and what brought us to the point where pain can play such a dominant role in our lives. In fact, this may just be the thing that it takes to turn one’s life around in a very positive and meaningful way. With good therapeutic support and a commitment to do some hard work on important life issues, chronic pain can be managed very effectively. For some people, mind/body strategies have been shown to eliminate pain altogether, even when all else has failed. People who have been through therapy which addresses pain report significantly reduced pain severity, lessened depression and anxiety, and decreased feelings of losing control. They report reductions in the degree to which pain interferes with their daily activities. Even if the pain continues, the sufferer can experience less distress and emotional suffering – and can become an active participant in life again. There are several good physical treatments that can alleviate pain. Some forms of acute pain respond well to painkilling medications ranging from mild analgesics to strong opium-based drugs for the most severe cases. Some chronic pain responds well to anti-inflammatory medications or antidepressants, although narcotic drugs are seldom effective for chronic pain (they may work for short-term acute pain) since narcotics tend to require ever increasing doses and they become less effective over time – not to mention their effect on our sleep, our mood, and our ability to think and perform clearly. Sometimes electrical stimulation methods provide some relief, as well as local anesthetics, surgical procedures, ice, heat, and massage. If these medical interventions fail, however, it may be time to take a hard look into some psychotherapeutic techniques that focus on the way we handle our emotions and our general way of living. 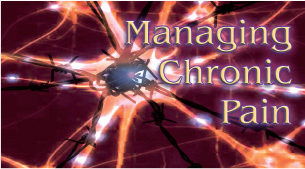 The first step in taking charge of chronic pain is to learn more about our experience of pain in a structured way. When we live daily with pain we sometimes lose track of just how severe the cycles can be, and we also tend to forget the better periods. We need to increase our awareness of the cycling of pain throughout the day and what we are doing to manage it. We also need to distinguish between the actual pain we experience and our emotional distress associated with this pain. Thus, it is important to keep a pain diary. This allows us to record our level of pain at various times throughout the day – and to see how pain is related to the time of day, mood, fatigue, stress, what we are doing, and whom we are with. It also encourages us to become aware of the crucial question of whether the pain is physical or more associated with our subjective experience of emotional distress. Our lives tend to be taken over by chronic pain. Our jobs, friends, and enjoyable activities all become secondary to this force that has taken over our lives. We put our lives on hold while we wait for someone – a physician, a drug, an insurance company, a friend – to come to our rescue. What we forget is that ultimately we need to be in charge of our own lives. We need to regain our sense of independence. “Is the pain in control or am I in control of the pain?” We need to shift to taking control of the pain. This may take some exploration in therapy of how we see ourselves and how we can allow ourselves to fall into the role of being the victim. It helps to embrace our pain, to acknowledge that it is a part of our life, and that it is there to serve a purpose. The pain is not the enemy that must be fought off – and as long as we hold on to this thought, it becomes very difficult to take control of the pain. It is only when we embrace the pain and take ownership of it that we can truly begin to know how the pain fits into the whole of our life experiences. We can then hear the messages that the pain is trying to send us. We can be both in control of the pain and in control of our own lives. You need to examine in depth the cost of your pain in your life – how it decreases your ability to enjoy your previous activities, your family, your friends, your peace of mind. But it is also helpful to see what hidden benefits the pain brings you (this is what we mean by “secondary gain” – the benefits that are not apparent at first glance). For example, it may be that the only time you get support and attention is when you are in pain; in fact, studies have shown that those who get support from their pain usually have higher levels of pain and are more disabled than those who do not get the support. Pain can also be the excuse that a person may use to deal with problems in a relationship – or example, the wife who feels left out of her marriage because of her husband’s job, or the husband who is afraid to open up emotionally to his wife. These are difficult issues to face, but they can be examined in therapy. One goal of pain management is to see how you can meet your goals in a healthy way rather than relying on being in pain as a way of achieving your needs. Our pain tends to increase when we keep our feelings to ourselves. Of course it is understandable that we may be reluctant to voice our deepest fears and anxieties, especially when we are in pain. We may be anxious about the impact of the pain on our jobs, our relationships, our future plans, etc. And we may harbor a great deal of private anger about being in pain – “Why did this have to happen to me?” We may feel that we do not want to burden others, especially those with whom we are close or who depend on us. Learning to express these feelings openly and taking an assertive approach to dealing with your life’s problems is an important step in reducing your experienced pain and in taking control of your life again. These are but a few of the techniques that can be explored in dealing with chronic pain. You are invited to explore the many alternative ways of dealing with pain that therapy has to offer. Relaxation: When your body is stressed your pain increases, and when you are in pain you may experience more stress. Break this cycle by learning one of several common ways to relax. Learn the art of diaphragmatic or abdominal breathing (this is the way babies breathe, but by the time we grow up we learn to breathe by expanding our chest, and this sets us up for increased tension and a loss of the sense of our own bodily rhythms). Practice progressive relaxation. Learn how to take quick relaxation breaks throughout the day. Find a friend who is interested in massage and practice on one another. pain and increases your level of daily activity. Spend half an hour per day engaging in some activity that gives you pleasure (take a walk, listen to music, do something helpful for someone else, etc.). Rediscover the joys of incorporating pleasure into your life again. Meditation: You may want to learn one of the common meditation techniques. The mind is not geared to staying active at all times, a common problem when one is preoccupied constantly by pain. Achieving a state of “mindlessness” can allow us to experience our bodies, our thoughts, and our feelings in different ways. Alternatively, one meditation technique called “mindfulness” encourages us to stay passively focused on our pain and to simply observe it. This allows us to distinguish between the existence of the pain and the fact that we are the ones who experience it – and when we get to this point, we know that we can control how we experience the pain. Guided Imagery: There are many very powerful techniques one can learn, especially with the help of a trained professional, which tap into the ability of the mind to explore methods of examining the pain experience in nonlogical, nonsequential ways.